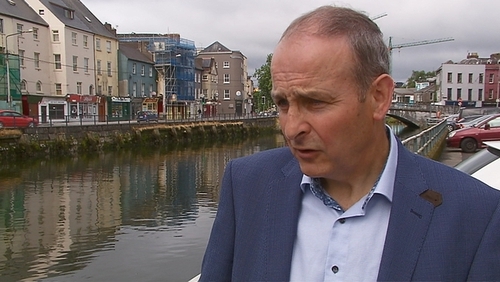 Fianna Fáil leader Micheál Martin has accused Mary Lou McDonald of extraordinary arrogance in her Ard Fheis speech, and of having a sense of entitlement that somehow Fianna Fáil or Fine Gael owe Sinn Féin power. Speaking on RTÉ's This Week, Mr Martin also accused Fine Gael and Sinn Féin of trying to manufacture a snap election. He said Fianna Fáil would honour the confidence and supply agreement which includes support for October's budget and the arrangement would be reviewed at the end of the year. Mr Martin said he continues to have issues with Sinn Féin as a political party in terms of how it operates, what he called the absence of true democracy, the control from the centre by shadowy figures and the legacy of the Troubles. "Just because you change the podium, you don't change the party," he said. He said the majority of the Irish public do not want to have shoved down their throats a particular narrative of the past that Sinn Féin seems to be insisting that we must accept. He described Ms McDonald's first televised Ard Fheis speech as party leader in Belfast last night as "flat and absent in substance". Mr Martin said Taoiseach Leo Varadkar deliberately added and fed into the hype that a motion of no confidence in Minister for Housing Eoghan Murphy that was considered by Sinn Féin could cause a snap election. He said Fianna Fáil would not have supported such a motion, and he was surprised by the hype and creditability attached to it. "I'm not going to be distracted from the course that I set out last March by any motion that may emerge in the next number of weeks or months tabled by Sinn Féin or anybody else," he said. "Fianna Fáil will decide its course and will not be reacting to whatever Sinn Féin does or whatever any other political party does," he added. Mr Martin said there is an element within the Fine Gael leadership that was getting ready for an election and wanted a snap election during the summer. He said some Fine Gael ministers had been openly gunning for an election. He warned Fine Gael and the Taoiseach against contemplating unilaterally trying to break the confidence and supply agreement. He said the confidence and supply agreement had delivered stability for the Irish people in the aftermath of an election with a fragmented result and he believed Fianna Fáil deserved some credit for that. "We are going to negotiate a third budget. Beyond that we will enter into a review at the end of the year in line with the agreement," he said. He confirmed that nobody in Fine Gael had yet directly raised the prospect of extending the confidence and supply agreement with him.